I got to spend the afternoon on a chilly Sunday in the UWS with Steph and Sam! They are incredibly chill and incredibly TALL. These guys fully embraced my weirdness and we had the best time, despite it being the coldest morning of the season. Thanks for showing me your neighborhood in all its fall glory! 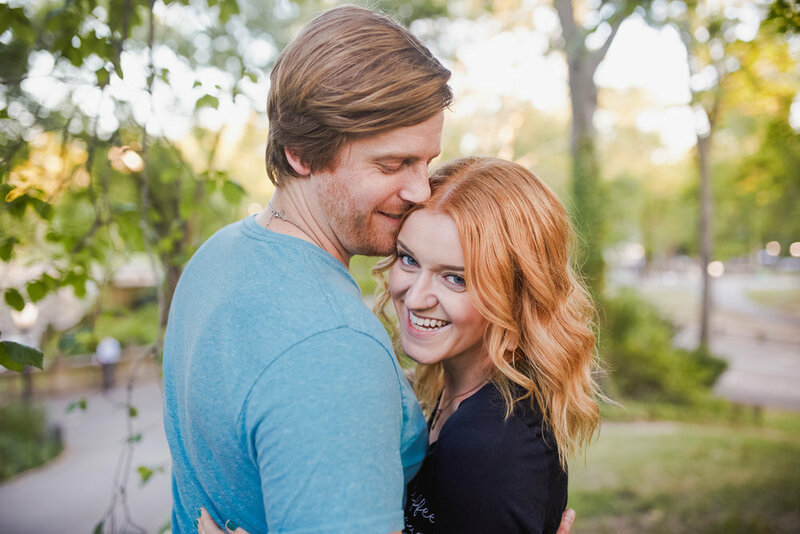 This shoot was a huge reminder that engagement sessions don't have to be awkward and stuffy. They can be playful, untraditional, and loads of FUN! Emily and Chris are awesome, eclectic, hilarious humans who were more than down to take every weird suggestion, run with it, and make it their own. We shot on a Monday in June with highs in the 90s and humidity that felt like an outdoor sauna. We started in air conditioning at the Strand Bookstore, where they first met through a meet up. We wrapped with an unplanned dip in the fountain at Washington Square Park and it was glorious! However, I did not envy them when I watched as they put dry socks on their soaking wet feet. For the record, this was my third couple who had been on board to go swimming in a public fountain, and it's always the MOST fun. My goal is to always capture stories that represent each couple and and their unique, multilayered personalities. I hope these photographs will put a smile on their face when they look back on them many years from now. Cannot wait for this wedding in March 2019! One of my favorite people, friends, and colleagues is having a BABY. I've known about this ever since Caroline declined a glass of wine at one of the best happy hour deals in town - something she NEVER does. I waited patiently for 13 weeks to get the confirmation I knew was coming and I couldn't be more happy for these two. I've known Caroline and Billy for about six years and they are nothing but loving and supportive partners in life and in marriage. They share a unique bond that people around them notice and admire. I have no doubt they will make beautiful parents. 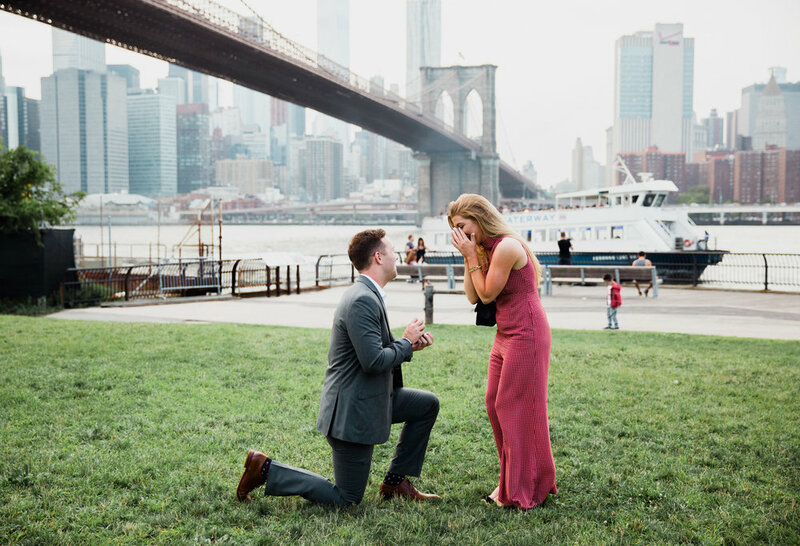 I was ecstatic when Drew wrote, telling me he was going to propose to his high school sweetheart, Amanda. They met when they were 16/17 and the rest was history! Leading up to the engagement, Drew was a little nervous... and running late. He was texting me from the cab, letting me know he was in crazy traffic and Amanda "took forever to get ready" - something my boyfriend has complained about for years. Luckily, this gave me plenty of time to scope out the perfect spot and pretend like I was a tourist while light testing. My heart was beating like rapid fire through the whole proposal and I kind of blacked out? (I didn't). I think the photos pretty accurately capture the full range of emotion Amanda experienced through this sweet surprise. Carlos and Michelle are both amazing photographers living in Brooklyn and contacted me to work with them on their engagements and wedding. It's always an honor for a photographer to get contacted by other shooters. It means they look at your work with a critical eye and still like it enough to reach out - and I will forever be grateful!